Click here for the help file. This software has been created because i need it myself. Nowadays you can find hosts to upload your pictures very easily, however if you want to keep in mind what you have uploaded and where, you have usually to register and it is boring to login each time in a host to upload pictures. So it is not a perfect solution to use these hosts directly. For example if you want to grab pictures from a webpage to use them elsewhere on your favourite board, there is no native tool to do it fast: you have to copy and paste each file manually. I don't want to explain of each features of the software, but there was in my opinion a tool that was missing in order to manipulate pictures easily for day-to-day operations. 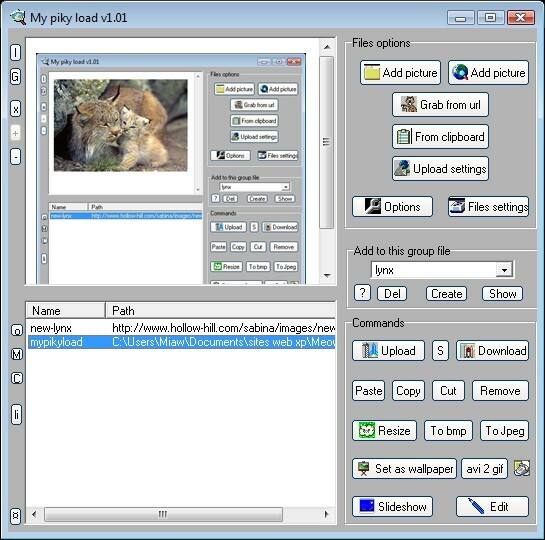 -Minibrowser to handle pictures for an online purpose (but you can add everything that loads in your browser). -Make several lists of files: you can add lists as long as your computer can handle them. - Check links online and off-line. - Removes file remotely if you are using you own ftp host. - Convert bmp, png and gif to jpg. - Convert png, jpg and gif to bmp. - Option to set wallpapers, (now you can keep in mind your previous wallpaper). - Tool to convert avi to gif. - Pay option to upload pictures to your gsm. - Slideshow with a full screen browser (now you can make slideshows of webpages). - Edit file description, or if you want rename the file. - Easy copy and paste for html and bbcode (several options, if you select one or more files). - The Internet Explorer's context menu can be customized with 3 options of the software. - Customize the software with a wide selections of options.